The moon is a pretty stable object in our skies; it’s been a constant feature for as long as humans have been around to look upwards at it. Unlike a pool of water, which can evaporate over time, the moon is made of rock, which doesn’t lose mass over time, even in the harsh environments of space. Radiation from the sun does bleach all the surface material on the moon, but it shouldn’t remove any significant amount of material. What can remove material from the moon is an impact - something sufficiently energetic could punch a divot into the moon, and fling material out away from the surface. However, large impacts are increasingly rare in our solar system - we’ve pretty much used up all the chaotic large objects in impacts much earlier in the lifetime of our solar system. This means that a large-scale event is extremely unlikely (although not impossible). What’s much more likely is that the moon will appear smaller. The moon is on a slightly elliptical orbit, which means it has a closest and furthest distance from the earth as it goes around us, instead of staying at exactly the same distance away from us, as it would if it were orbiting in a perfect circle. The difference between the closest and furthest approach of the moon is about 43000 km - and it results in the apparent difference in size pictured above. On top of this orbital change, the fact that the moon drives our tides - and is in general interacting with us gravitationally - means that the moon and the earth are slowly exchanging energy. This interaction is gradually slowing down the Earth’s rotation and allowing the moon to drift away from the earth. This happens at an incredibly slow rate; we’re talking about 40 millimeters (1.5 inches) every year. Compared to the normal orbital variation of 43000 km, this effect is barely noticeable, and certainly won’t be noticeable to the human eye. But, the next time you hear something in the news about a Supermoon, remember that it’s the closest the moon will ever be to the Earth, if only by a few millimetres. 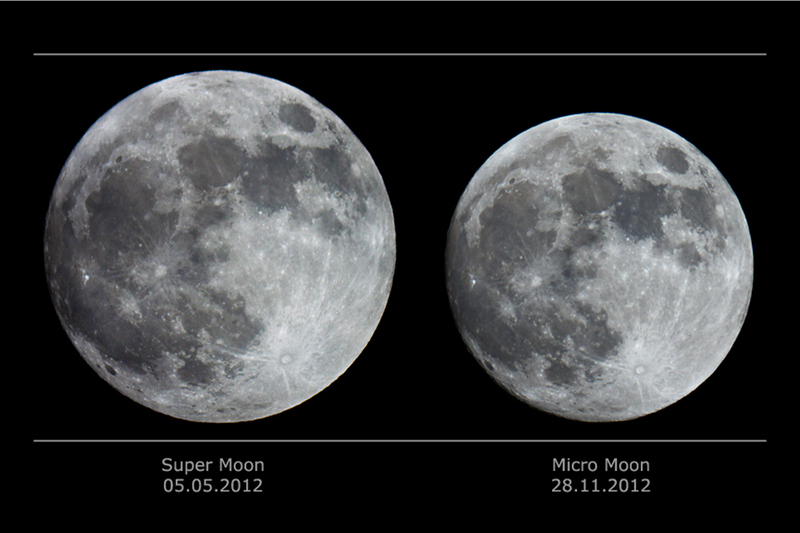 By the same token, each Micromoon gets a few millimeters more distant - and therefore a tiny bit smaller - each year. What are the types of stars?